Scrapping With Characters: The Race is ON! Good morning!!! I finally found exactly what I needed to give my mojo a good swift kick to get moving on this Disney vacation album! 2 Broke Girls is having a Sketchathon this month. I'm new to this group, but WOW! THe sketches clicked with me right away. This is fantastic!! 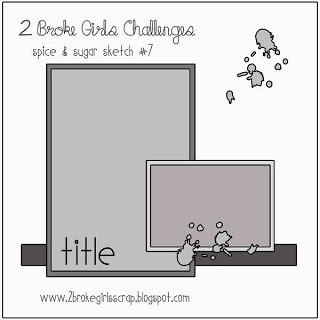 Thanks for playing @ 2 Broke Girls!